Several of you have asked about the costumes we have been wearing today, the bunad. I didn't take a photo today, but here is one which was taken exactly two years ago on Ingrid Elise's confirmation. 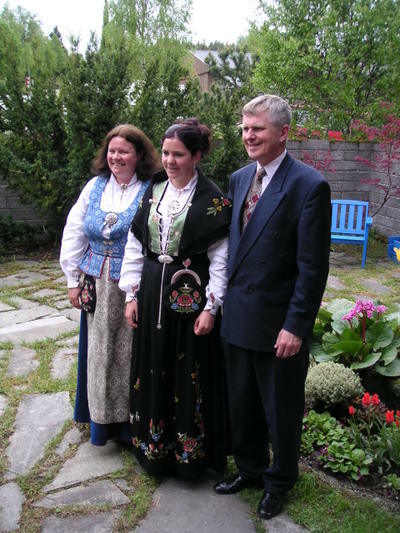 Ingrid is wearing a bunad from the south western part of Norway (where Terje's family live), and I have the traditional "Trønder bunad" from the area where we live. The trønderbunad can be made in three different colours, blue like mine, red or green. The photo was taken in our garden.